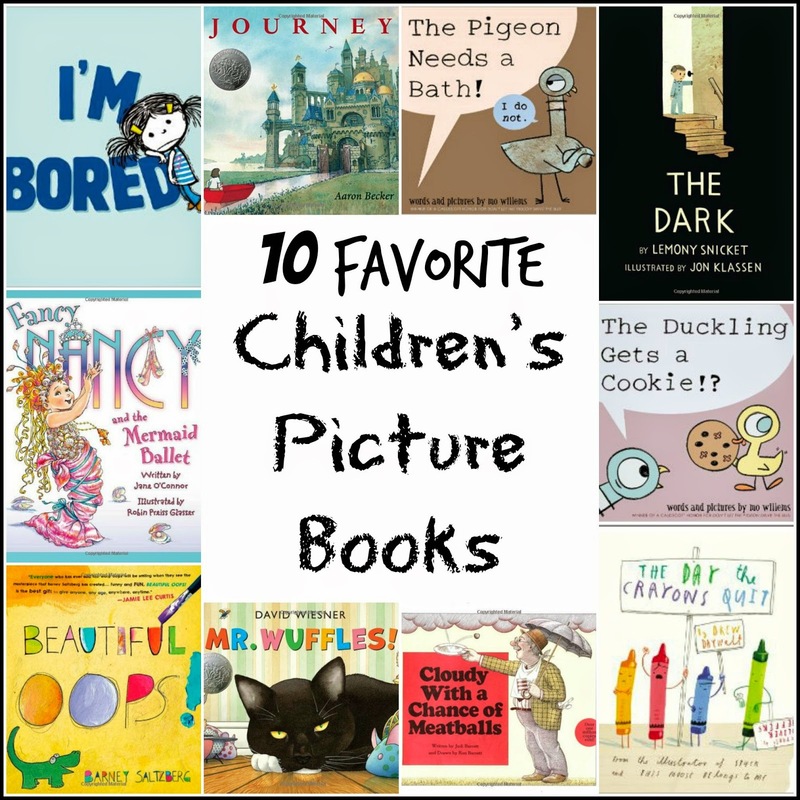 I love sharing our favorite books with you all and what better week to do it than during Children's Book Week 2014 (May 12 - 18, 2014)? This is a list of some current favorites. Be sure to check out our posts from Children's Book Week 2013 and Children's Book Week 2012 for even more book suggestions and links to hundreds of activities to explore awesome children's books with your children and/or students. Journey by Aaron Becker - This wordless picture book is one I can not stop raving about! The illustrations are breathtaking and the girl's journey is one that you can't help but get pulled into even if she couldn't get her family's attention. We have read this book countless times and simply don't tire of it. Each time we read the book, we find something new to look at in the illustrations. I love that the book allows us to tell the story, use our imaginations and get lost in its magic. This is one book I will be purchasing to share as gifts for a long time. The Duckling Gets a Cookie by Mo Willems - The pigeon and a cute duckling - how can you not want to open this book. We couldn't resist. This book is not one of our favorites in the series (see below for our latest fave!) but it's wonderful for younger readers who will really enjoy it. We found it very simple but endearing. It's been added to our collection because I adore Mo Willems and plan to use it in my Kindergarten class as well. The Pigeon Needs a Bath by Mo Willems - Who can resist the pigeon? Not us! Both my girls and my students find him hilarious. This book was met with lots giggles throughout at the pigeons complaints and antics about taking a bath. This might be my favorite pigeon book yet. Though I sure hope Mo keeps them coming. Fancy Nancy and the Mermaid Ballet by Jane O'Conner - We are long time Fancy Nancy fans. Although the Lil Divas are mostly reading chapter books these days, we still enjoy our picture books and I can never resist purchasing the latest Fancy Nancy books. My youngest adores mermaids so I knew this was a must buy and it hasn't disappointed. Nancy is devastated about having to play a boring old tree in her dance show when she wanted desperately to be mermaid. The book helps teach some awesome lessons - how to handle disappointment (Nancy not getting the part she wanted) , be happy for your friends success not jealous (her friend got the part) and make the most of your opportunities (she made a wonderful tree!). It's quickly become one of our favorite Fancy Nancy books. The Dark by Lemony Snicket - One of my girls is very afraid of the dark. That's what first drew me to this book. She is the type that won't go upstairs by herself, won't enter a dark room, etc. My daughter saw herself in each page we read. It's a quick read and it's fun to have the Dark as a character. We always read it in a fun voice and it is a great reminder to my daughter not to be so afraid of the dark. The Day the Crayons Quit by Drew Daywalt - Imagine wanting to color and opening your box of crayons only to find that they had quit. That's what happens to poor Duncan. He goes to color only to find complaints written by the crayons about each other. It's witty, cute and a wonderful read-aloud for children (especially those who love crayons). It's a great way to talk about team work, how we all matter in the home or classroom and so much more. Mr. Wuffles by David Weisner - A cat and a spaceship of tiny aliens and insects - intrigued? There's a lot going on in this picture book and it's all wonderfully entertaining with humor, action and wonderful illustrations every step of the way. You'll never quite look at cats, insects and small toys the same again. I love the alien language dialogue - it lends itself to wonderful storytelling and you can have a different story every time you open the book. Beautiful Oops! by Barney Saltzberg - I LOVE this book! Every child needs to read this at least once and know that it's ok to make a mistake. I don't know how many times I have seen children cry over a "ruined" piece of art - my girls included. They get frustrated and want another paper or want to give up. I always tell my girls to look at it again - what can we turn it in to? You'd be surprised at how many awesome pieces of art we have ended up with just by thinking a bit outside the box. It's a skill that helps children in other areas because they learn to problem solve, think critically and not give up. This book takes ALL that and puts it into the cutest format with pop-ups, folded pages, etc. It's interactive and kids will want to read this one again and again. The great thing is - you won't mind doing it! Cloudy With a Chance of Meatballs by Judi Barrett - My girls get such a kick about reading about the town of Chewandswallow where food plagues their weather for breakfast, lunch and dinner. It's such a fun tall tale to read together and elicits so many giggles, belly laughs and yells of "oh no!". We can't help but wonder what it would be like if it really snowed mashed potatoes or if we suddenly found ourselves in front of car-sized donuts. I have shared this with children from preschool age thru 3rd grade and ALL of them have always loved it. It's a definite must buy addition to your child's library. Spending time reading with children has so many amazing benefits. Taking 15-20 minutes a day to sit and explore a wonderful book can really help your child grow into a lifelong reader. I have been reading with the Lil Divas every night before bed since they were born and it is truly one of our favorite parts of the day. I marvel that the little babies who I would read to as they fell sleep in my arms are now reading to me. We are sharing an all new reading adventure - complete with excitement about chapter books, favorite series and beloved characters that we just can't get enough of. Be sure to check out all the posts in our Reading Corner for other great suggestions and activities. Happy Children's Book Week & Have Fun Reading!